Kuala Lumpur – In line with ongoing efforts by the United Nations High Commissioner for Refugees (UNHCR) to assist refugees and asylum-seekers, International University Malaysia has embarked on a project to provide much-needed support for this marginalised group in Malaysia, through health educational services. This partnership was formalised in a Memorandum of Understanding (MoU) signed by the two parties earlier today, whereby Malaysia University through its community outreach programme, ‘University Cares’, will implement various projects to educate and empower young refugees to improve their health and well-being, as well as adopt positive behavioural changes towards better health. 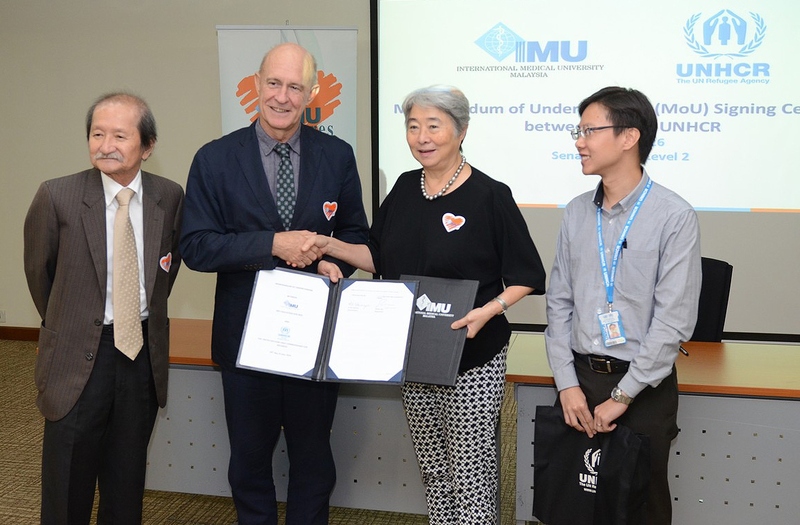 MoU exchange: Partnership formalised with a warm handshake between International University Malaysia and UNHCR Malaysia. From left to right: Professor Ong Kook Hai; Mr. Richard Towle (UNHCR Representative Malaysia); Dr. Mei Ling Young and Jason Yeo (Health Programme Associate, UNHCR Malaysia). This is an extension of University Cares’ ongoing outreach programmes, which has provided various healthcare education services to nearly 1,000 children comprising refugees, displaced individuals and Malaysian urban poor since February 2014. Dr. Mei Ling Young, Deputy Vice-Chancellor and Mr. Richard Towle, UNHCR Representative, Malaysia, signed the MoU on behalf of their respective organisations, while Prof Ong Kok Hai, Director of External Affairs and Dr Tan Bee Siew, University Cares Project Leader for the programme with Dignity for Children Foundation was present to witness this momentous occasion. This joint effort between UNHCR and university aims to not only improve health awareness and standards among refugees, but also help to safeguard the general health and wellbeing of all Malaysians. “Our government has poured a lot of resources into eradicating infectious diseases in the country. With the growing number of refugees and foreign workers in Malaysia, it is important to ensure that they too are receiving the relevant health education and self-care,” said Prof. Ong Kok Hai, Director of External Affairs. “We are pleased to be able to roll-out this programme that looks into the needs of a marginalised section of our community. With the help of UNHCR, University Cares can now reach out to young refugees and asylum-seekers, to educate and motivate them to improve their health by improving their hygiene, reducing risky behaviours, making healthier choices, and changing their overall attitudes towards health,” added Prof. Ong. Representations from International University Malaysia and UNHCR Malaysia after MoU signing ceremony earlier today. As at end June 2016, there are some 151,000 refugees and asylum-seekers registered with UNHCR in Malaysia, which includes some 34,000 children below the age of 18. These refugees live in low-cost and overcrowded flats or houses, with little access to hygiene and sanitation. They have access to public healthcare facilities but lack access to health information in order to make informed decisions regarding taking care of their health. University Cares was established in 2002 to raise funds for charity. It was later extended as a community service arm of university and has since engaged with various community partners in providing assistance to the less privileged in four key focus areas, namely healthcare (services and education), education (life skills, etc. ), environment (nurture an environmentally-responsible society), and humanitarian aid (includes raising funds for disaster relief, improvement of healthcare facilities, etc.). With its tagline, “Serving the Community”, University Cares has initiated over 140 activities since 2013 that have benefitted over 17,000 individuals from 50 organisations.